oh, it's so beautiful made!! Wonderfull!! I really want to buy this!! oohh..can't wait to get my copy in my mailbox ! CONGRATS !!! can't wait to see it in person! I love everything you do! Is it available yet? Will you have it in your Etsy? The book looks wonderful and I hope it will be possible to buy in Norway soon. Congrats on your book! It looks so great, I would love to hold it and look through it. 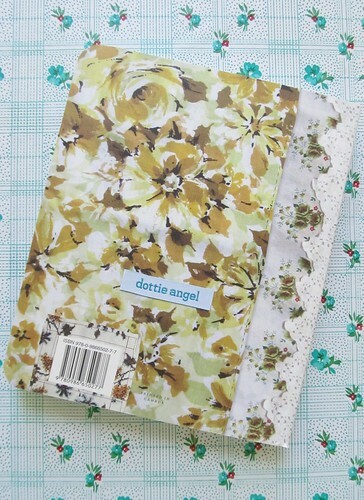 i like that you shared a little sneak preview of your g-o-r-g-e-o-u-s and divine little book and that it made me smile. Thank you! where can we buy the book Tiff? Looks great..funny I played i spy on my blog today! What a special day! Congratulations! The book looks beautiful. No wonder you are proud. The book looks lovely Tif! Congratulations! We've all been waiting for it! Your book is so beautiful. It looks so personal and handmade. Saving up my pennies to buy your amazing book! I can't wait! ***SQUEAL***....Tif you must be OVER THE MOON pleased & so very....VERY....V-E-R-Y proud....!!!!! CONGRATULATIONS Lovey....I'm SO looking forward to receiving mine....I just KNOW I'll have my nose pressed up against the window EVERY day waiting for the Postie....I'll let you know the MOMENT she arrives....!!! Hope you've had a FAB weekend....! It's beautiful! I absolutely love the spine and the rounded corners. It will make holding it such a treat. You should be glowing with pride, that looks gorgeous. I am so excited for you. This must be a great feeling to publish a book like this and be so proud and happy about it. I have preordered a copy and can't wait for its arrival in my letterbox. Hurry postie lady! Love reading about the book. It is a pleasant distraction while I wait out this pesky hurricane. Unlike DH, I cannot sleep through such a big storm. Am happy to hear your sweet child is ok. And happy to drift off, even for a few minutes, to a kinder, gentler world. Thanks. Oh, your new book looks absolutely amazing and so beautiful! I love inspiring pictures and your book seems to be full of them! 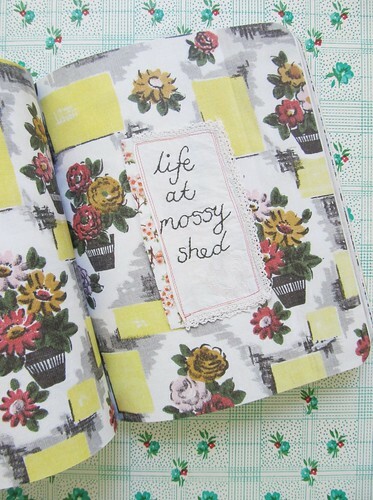 What a lovely, inspiring little-bitty book! 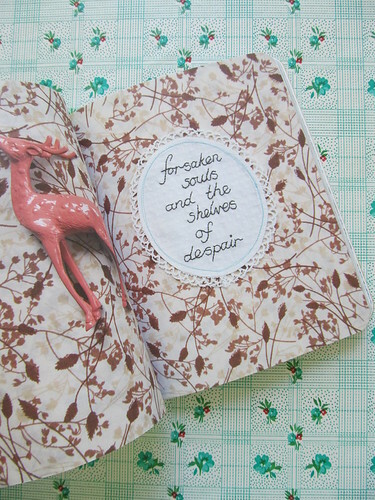 How beautiful it looks, how lovely and nostalgic the pages appear to feel, how so incredibly artsy and crafty! I'm loving all of the patterns and flora and fauna designs. This is making me dream of dreams! Congratulations! Hi Tif..well done..congratulations it looks a perfectly wonderful little book! I cannot wait to hold it! Your book looks so splendid!!! Congratulations! i will order one to my mailbox very soon! like it ... I am in love - now to get my hands on a copy - now!!! I can see why you have a great case of the likes! It's very sweet looking and inspiration is always quite magic! Where can I buy this lovely book??? How Exciting! 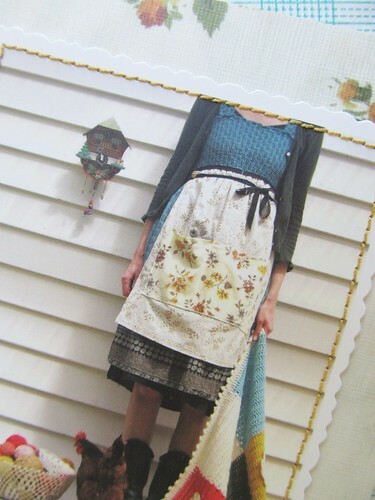 I am waiting with anticipation for the mailperson to visit my mailbox, so I too can hold your fabulous book in my hands. Congratulations! your book looks lovely! Stunnig I might say. Sad point is that I've been trying to buy it, but there is something wrong with the system of Uppercase. I hope I will get my order done. Things I like ... my sister being a published author!!!! Can't wait to read it! SQUEE!! can't wait to get it! 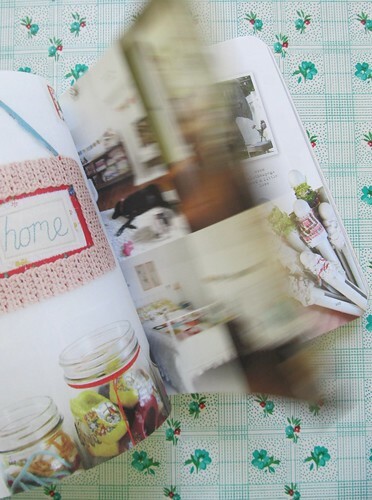 ...your blog is beautiful and your book looks equally as yummy!!... I am in the UK, will I be able to grab myself a copy over here??? 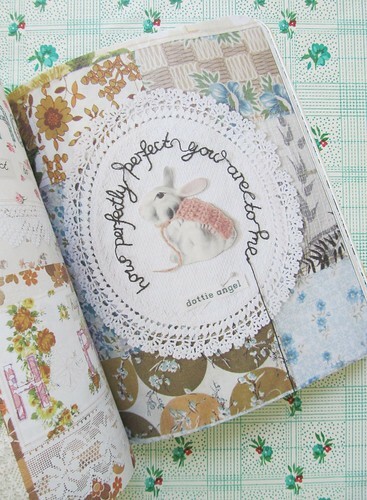 Tif, only recently found your blog via Molly Makes and am so glad. I almost didn't want to look at the pics of YOUR book because it will make the happiness much huger to be looking at my copy which I am looking for! Many congrats to you. It is a wonderful time to enjoy. 1. it's coming soon to a mailbox near me! 2. it's canadian made, just like me! 4. it shows what 2 creative minds can come up with. What a happy moment! And what a lovely book!!! It looks like a dream-come-true to make, and a dream-come-true to read. Your book looks positively awesome! I hope that I can get it here in South Africa, if not, does uppercase do international postage? I sure hope so! Congrats on this wonderful achievement!! That looks great :) Congratulations! Congratulations, looks like a sensational read. Love your handstitching, something i've just started to do. Well done, very exciting. i am completely and utterly overwhelmed by your response to my book post... as i sit here today reading each and every comment i tell myself just how fortunate i truly am to have such kindness from others come my way. thank you from the very bottom of my crafty heart! as for getting hold of a copy. and in a few weeks or sooner i hope to have some available in my etsy shop. i appreciate it is somewhat tricky as the book is not available in mainstream book stores. however as you can see, going with an independent publisher was an important part of making this book what it is. 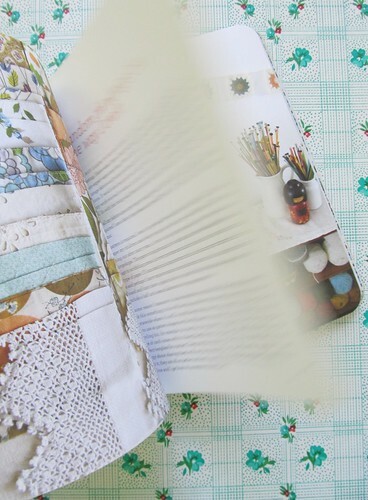 for Janine was able to bring the handcrafted elements for this book come alive. both Janine and myself cannot thank you enough for the support you have given us with the pre-orders, orders and your words of congratulations and support. this does seem to be the book of all books. I as much want to hold it as read it. In complete awe that something like this can be made. I cannot wait to get your book .. it is the perfect book to have while you are sitting in a big comfy chair with a cup of coffee . It truly looks beautiful and I will be a happy girl once I have a copy in my hands ! Congrats on this exciting adventure ! Just a quick note to say how much we enjoyed being a part of your book project, everyone at our shop took great care in the work they did, from production planning, prepress, our press crews and all of the people in our bindery that worked so diligently applying the card, label and packaging together with the incredible envelope of goodies. 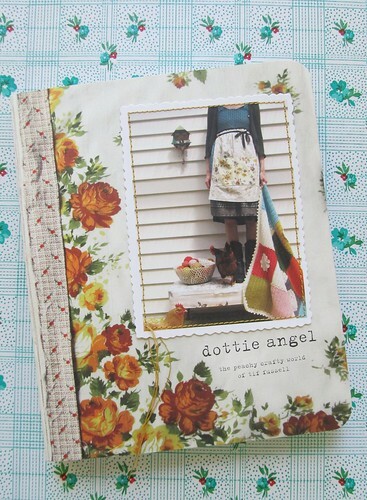 It was a fun project and we wish you continued success with Dottie Angel! Wonderful news Tif - at long last! Sending many congratulations to you, my friend. Can't wait to get a copy. Uh, I love everything about it!!! So pretty! Congratulations! My copy is slowly making its way to Australia. Hurry up Mr Postman! Can't wait to see it. Uppercase are a fine and talented bunch. Hello Tif. 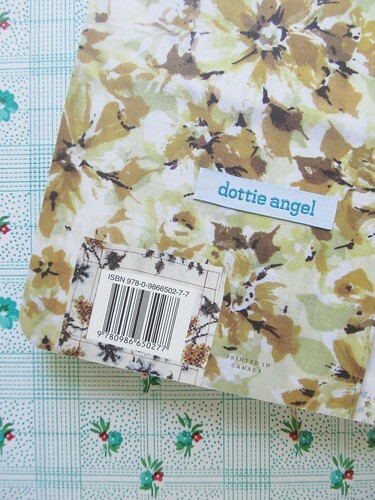 Having pre-ordered your book so long ago thru Uppercase, it was such a nice surprise to find it in the mail yesterday! My eyes have been glued to it every spare moment I get. And I just wanted to tell you how much I love the book. You are such an inspiration and I am kicking myself for not reading your blog sooner. My copy arrived from Uppercase! Just in time, as I was confined to my bed with a very rare cold...I curled up there under a quilt crocheted by my Grandmother Mary, and read it from front to back and back again. I love the book, and got so many great ideas...I'm know to you bolg, so it's delightful to find that there is MORE. I hope you have a wonderful time in Minneapolis..!